Last week, I found out about Millennium Monday’s in March at the Millennium restaurants. We cut back on eating out this past weekend, so we could take advantage of this fantastic deal. All day, Monday’s in March, with a coupon, you get 40% off at Epic Bistro, Fieldstone Grill, Union Cabaret, and Martell’s. I’m really bummed I found out about this so late. I probably would have taken advantage of it every week! We decided to go to Martell’s for lunch. There’s still one week left, so maybe we’ll try one of the other two we haven’t been to. 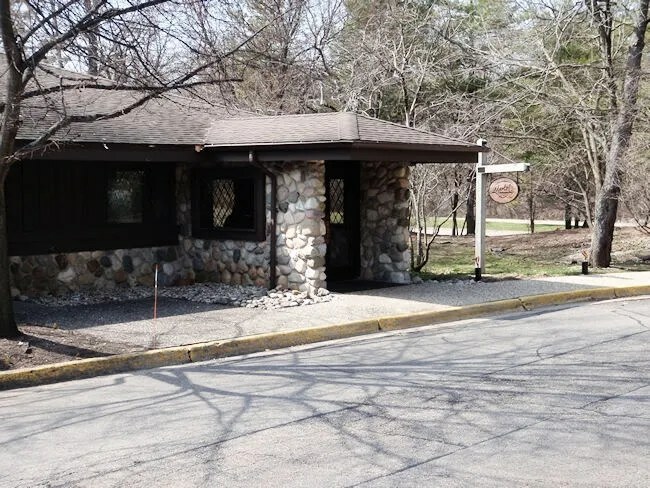 Martell’s is on Greenleaf Boulevard in a really secluded part of Kalamazoo. It sits right on Willow Lake. The restaurant is in the Parkview Hills community. You really would next expect to find a restaurant as you’re driving down Greenleaf Boulevard. If it wasn’t for the signs directing us back towards the lake, I would have assumed I took a wrong turn. Once you get to the restaurant, you won’t find any flashy signage. From the road, there is a wooden sign that blends in with the trees. On the road, the sign still says Black Swan, so as long as you know the restaurant’s former identity, you shouldn’t have a hard time finding the new place. Martell’s sort of shares a building the management office for Parkview Hills. It’s a really unassuming building with parking in a large lot nearby. We stopped in for lunch just after 1:00 on a Monday and it seemed like we weren’t the only ones taking advantage of the 40% off. Martell’s is a fancier restaurant than J and I usually go to. There are a couple different dining areas. One dining room near the entrance has cloth-covered chairs in a dimly lit, but cozy dining room. The other dining room has huge windows overlooking Willow Lake. Almost all of the tables near these windows were full yet there was still a two-top available for J and I.
Martell’s has a pretty large drink menu printed on the reverse side of their menu, but we both ordered Coke’s. Since we had the 40% off, we decided to stray from our usual sandwich and fries lunch. Martell’s is the Millenium Restaurant with the Italian flare, so we both decided on pasta dishes. I picked the spaghetti and meatballs and I was very surprised at how large of a portion I got when the plate was set down in front of me. The pasta is all homemade and it’s covered in a thin red sauce. 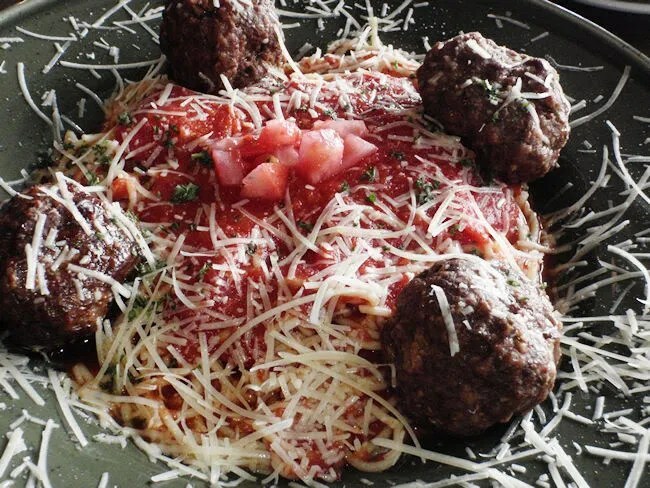 Four large meatballs were placed on each corner then the whole plate was sprinkled with grated Parmesan cheese. The thing that really surprised me about this dish was the meatballs. They were large pieces of meat, but they were cooked perfectly and still moist. The spaghetti was soft and there was plenty of it. I ate about half of the spaghetti and two of the meatballs before giving up and having the waiter pack it up for dinner. J started with the House Salad which would have almost made a good entrée on its own. 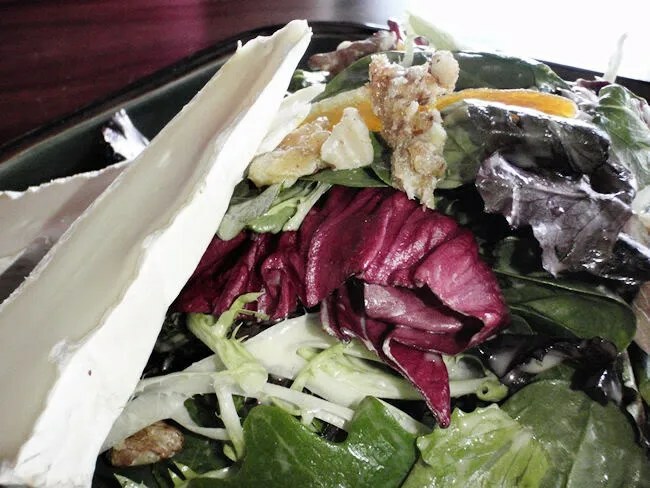 The mixed greens are topped with dried apricots, candied walnuts, and a tangerine vinaigrette. There were also two wedges of ripe brie cheese. J loved the salad. She said the walnuts were delicious and really liked the cheese that came with the salad. If the salad had been a little bit bigger, it’s something she could have seen ordering as an entrée. For her entrée, she went with the rotini and cheese which was my second choice. J said before the dish was set down in front of her that she loves grown up Mac & Cheese dishes and that’s exactly what this dish is. 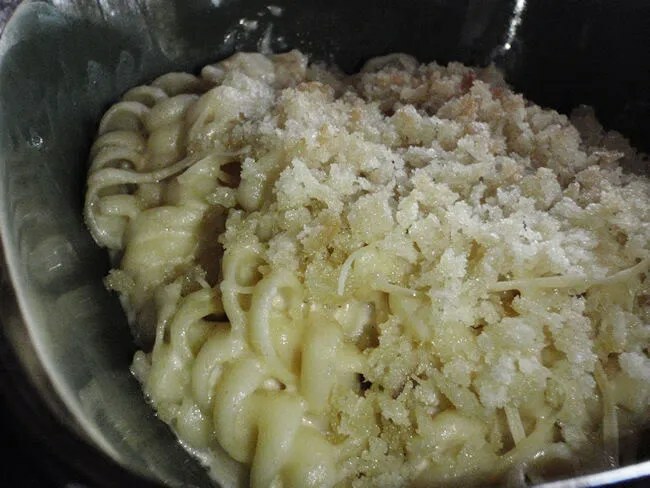 The rotini is mixed with sharp cheddar, Parmesan and goat’s milk cheese then it’s backed with a bread crumb topping. The pasta was very creamy and the goat’s milk cheese gives the dish a depth that you can’t get from the basic Cheddar Mac. Her favorite part of the meal was the crunchy topping. You almost wish they laid the pasta out flat just so there would be more crunch. Our bill before the discount was a little over $31. With the coupon, it came to about $21 which is in my wheelhouse for lunch. The Millenium Monday promotion is a really good idea. Monday’s are typically slow for restaurants and it got us into a restaurant that is normally out of my league. 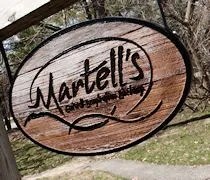 We know now that Martell’s has a really great atmosphere and a menu that is not out of reach to pub-grubbers like us.